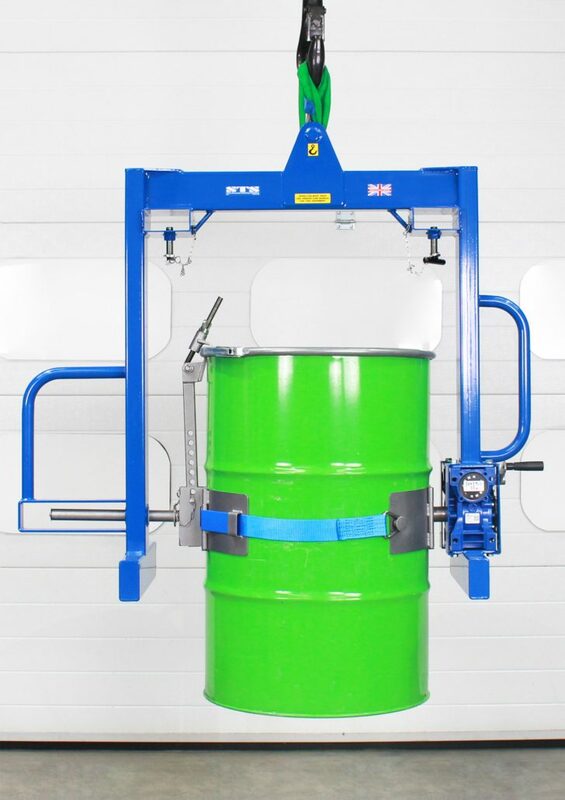 The unique Overhead Drum Rotator uses our trademark variable band, accommodating drums from as small as 50 litres right up to 220 litres, whether steel, plastic or fibre. 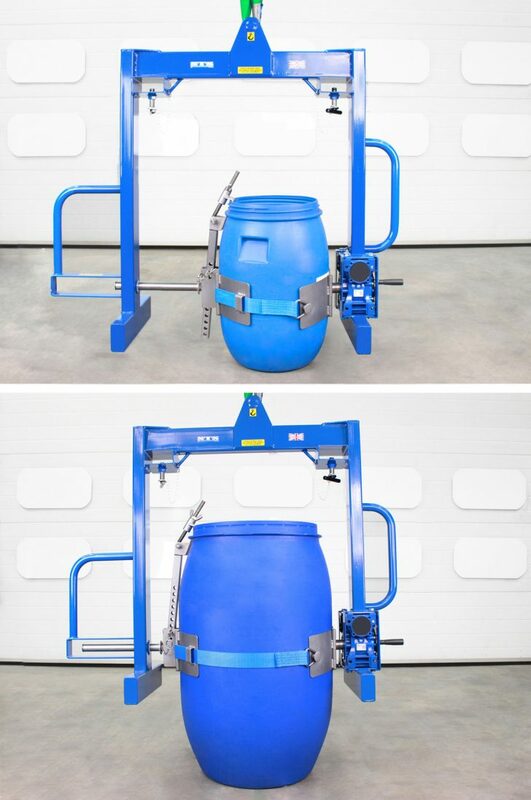 Our rim-locking device provides a second securing method, eliminating any risk of the drum slipping while being decanted. Our drum band is unique in the drum handling industry. 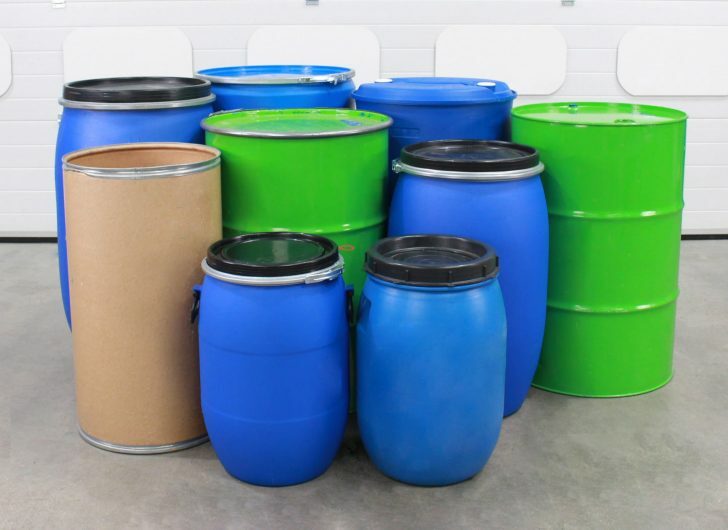 With our stainless-steel band you handle steel, plastic or fibre drums from 50 to 220 litres. Simply adjust the variable band to the size of the drum and secure the drum with the ratchet and polyester strap. 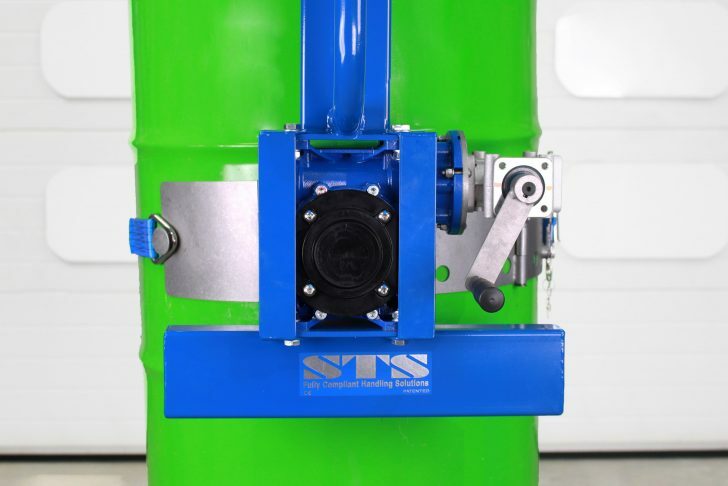 The drum rotator comes with a rim-locking device, which attaches to the lip of the drum to add a second level of security. 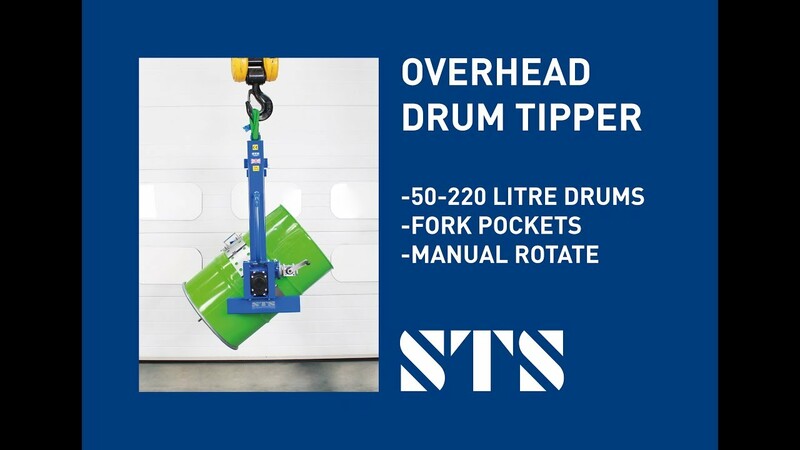 This allows you to safely handle a vast range of drums, some of which cannot be handled by other equipment on the market. All of our drum rotator models include a high-quality self-locking rotational gearbox. 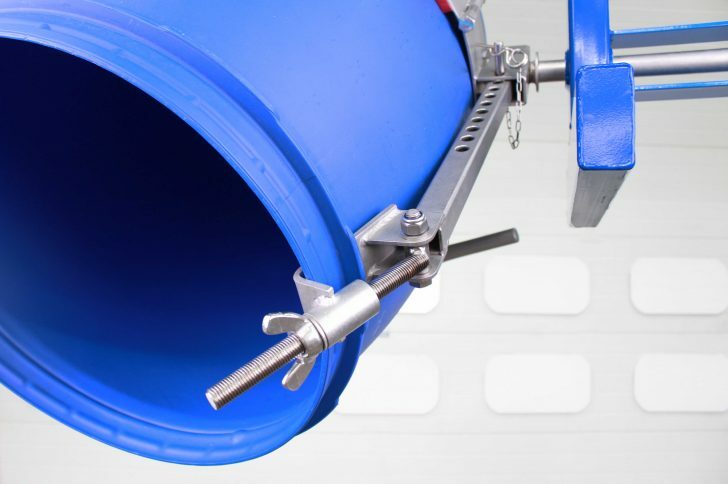 This makes sure that when you’re handling drums they always remain under control and never self-rotate. The base model is operated by hand but we can also provide units with power rotation. The clamping band comes with a sliding pivot, allowing you to quickly adjust the diameter of the band to fit various drum sizes. This is especially useful if you work with a variety of drums in your process. With multiple pick-up points, the DRU02 is a great choice if you need a versatile drum rotator. 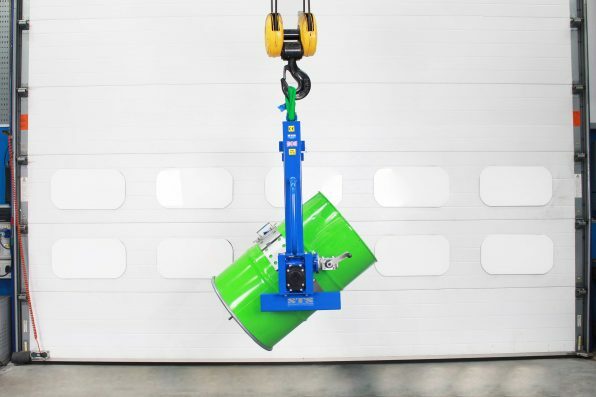 When you’re using an overhead crane the large lifting pin provides a secure fixing point, while fork pockets allow you to mount the unit on a forklift truck. Our Overhead Drum Rotator is suitable with a wide range of drum types, sizes and materials. For a detailed list of compatible drum types, see the drum suitability document below. 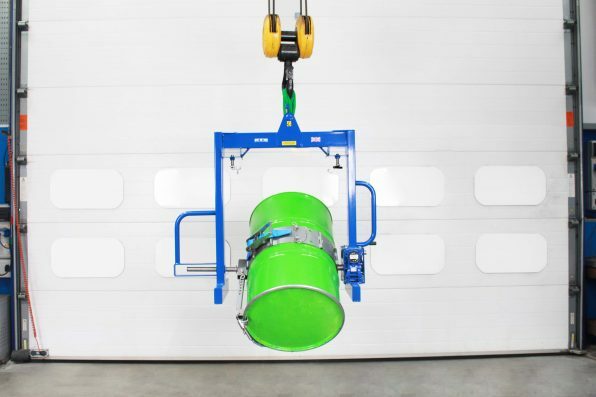 We can provide a fully-certified ATEX overhead drum tipper for use in hazardous zoned areas. Our DRU02-SS-Ex is constructed from 304-grade stainless steel, this eliminates any thermic-strike risk. This model is suitable for gas and dust areas: Zone 1, 2, 21 and 22. All our ATEX drum handling equipment is supplied with a manufacturer’s EU Declaration of Conformity. We can provide this model certified to ATEX Directive 2014/34/EU – suitable for use in an ATEX Zone 1 environment. We can offer a range of stainless finishes on this unit to make it suitable for clean rooms as well as good manufacturing practice (GMP) areas. 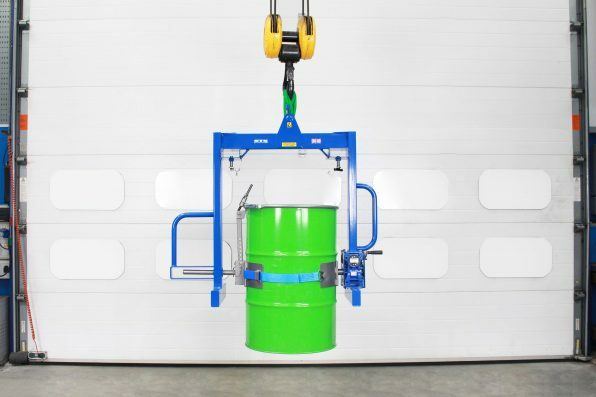 If you’re only handling 200- to 220-litre steel and plastic drums, our fixed over-centre drum band makes securing and handling drums quicker. In the UK we can supply certain equipment on a sale-or-return basis, meaning you can use a unit on-site for seven days with no obligation to buy it once the trial period is up. Find out more here. 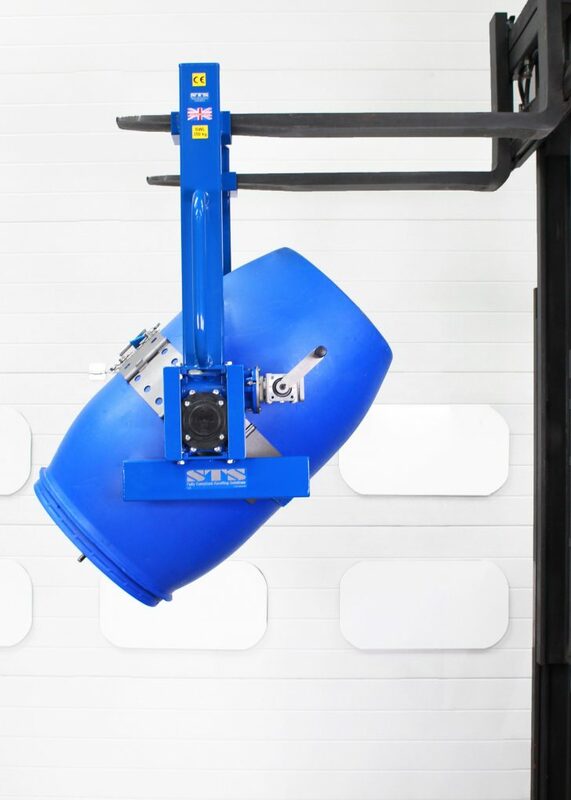 See the full technical specification for our Overhead Drum Rotator (Universal Band) for details such as weight, dimensions and load capacity. View the instruction manual for our Overhead Drum Rotator (Universal Band), which details how to safely operate and maintain the unit. Tipping drums is an essential part of many industrial processes. 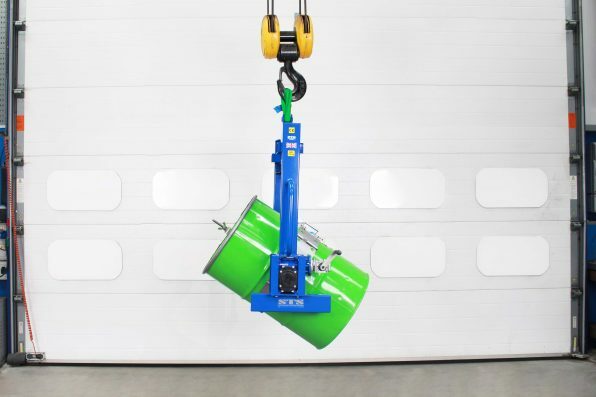 Our drum rotators provide a safe way to lift and tip various drum types and sizes, and we can customise each rotator to suit your exact needs.